Fall is officially here! We love the variety of rich colors that make this season so beautiful. There are many new and creative ways to decorate for this wonderful season. We love these pinecone topiaries. The green pine needles in the base of each metal container bring a nice contrasting color to the piece. 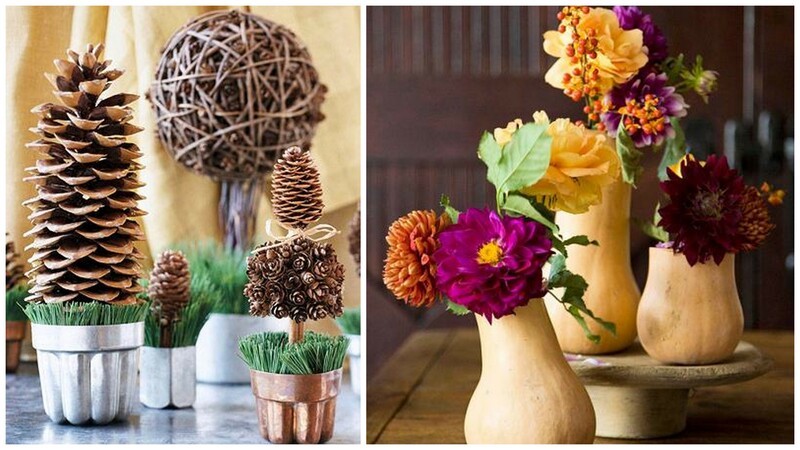 Using gourds as flower vases is a great way to use a traditional fall piece in a unique way. The deep jewel tones of these flowers look lovely together and bringing purple into your fall decor brightens the arrangements. The sprig of berries adds texture to these soft flowers. Cut some of the gourds shorter than the others to add variety to the height of your arrangements. This door decoration is adorable and very easy to make! Just take wooden letters from an arts and crafts store and paint them in oranges, greens, and yellows and hang them from your door using fun patterned ribbons. The pumpkin entryway pieces make a great statement. We love the addition of the family initial on the pot. If you are looking for a simple way to accent other arrangements, these fall leaf votives are a great way to do it. Wrapping brightly colored fall leaves (real or artificial) around a candle votive with twine creates a festive accent to any table. For a more subtle fall accent, consider painting miniature pumpkins with gold metallic paint and use them as placecards at your next dinner party. These pumpkins can add a little sparkle to the rest of the table if you scatter them among other arrangements or group them together in the center of your table for a more clean look. Fall is a great season to spend time with your family. 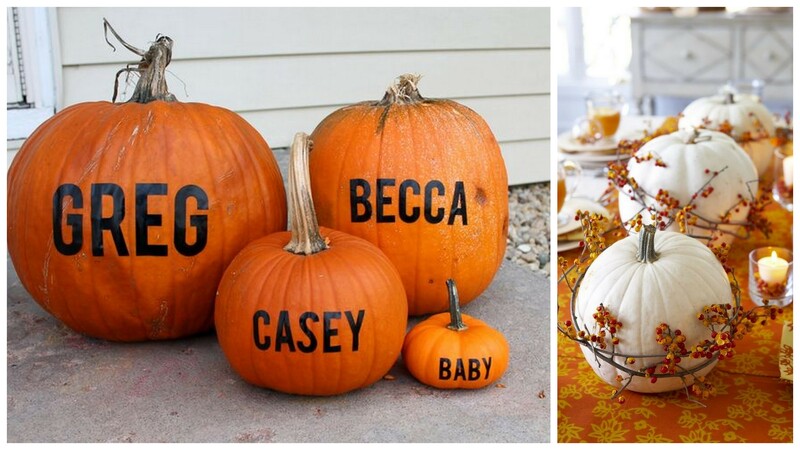 Instead of dealing with the mess of carving pumpkins this year, try decorating pumpkins with each family member’s name using paint or stick-on vinyl letters. Other designs can be added to the pumpkins for a more personalized look. White pumpkins are a fun new trend in fall decor. We love how they were used in this table centerpiece. The contrast between the red and gold berries and the white pumpkin is beautiful and gives a bright clean look to a table. Using warm rich colored table cloths underneath the pumpkins makes them pop. These pumpkins would look great on a mantle or side table as well. If you are looking for a fun way to bring flowers into your fall decor, we suggest this fun project. Glue fall colored flower heads to pumpkins. You can create solid colored pumpkins, or have fun with striped patterns or polka-dots! Placing all of your decorated pumpkins together on a table creates a lovely arrangement. For a clean classic look, we love this monogrammed pumpkin on a front porch. To re-create this beautiful look, paint a large pumpkin white and then add your family’s monogram. 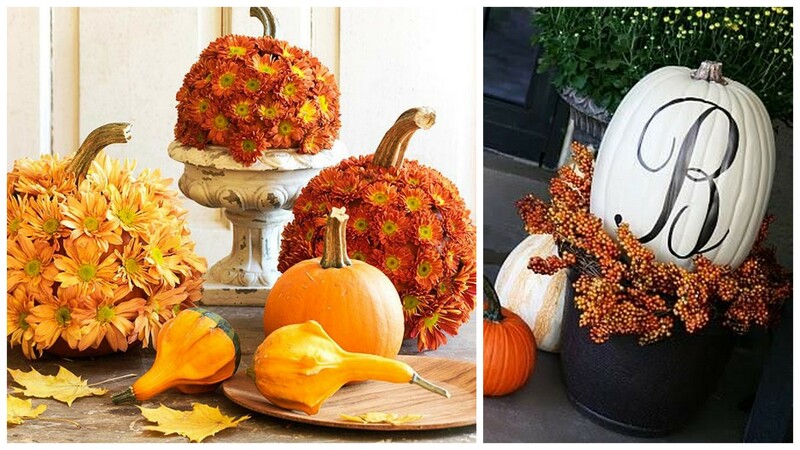 Place the pumpkin in a large pot and accent with berry vines to complete the look. We love decorating for the different seasons! 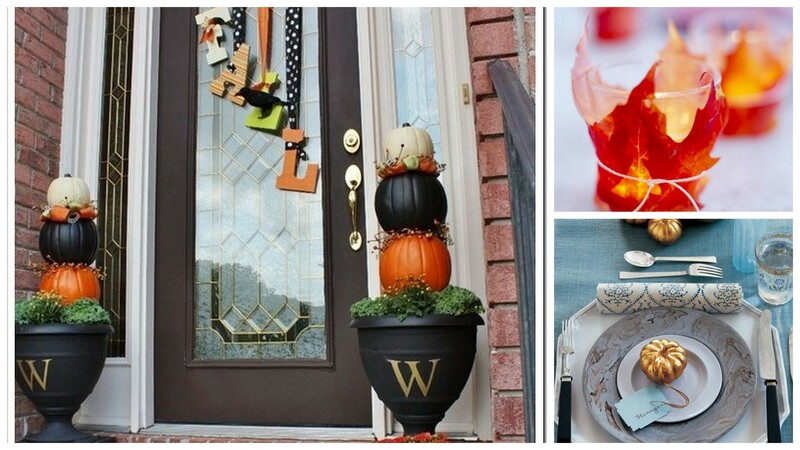 Are there any unique ways you decorate for Fall? When guests arrive to an event, you want them to be wowed! Creating an impactful event entrance can set the theme and the tone for the rest of the night. There are many ways to create a grand entrance for an event, and we want to show you a few of our favorites. This rose covered tunnel definitely makes a “wow” statement. 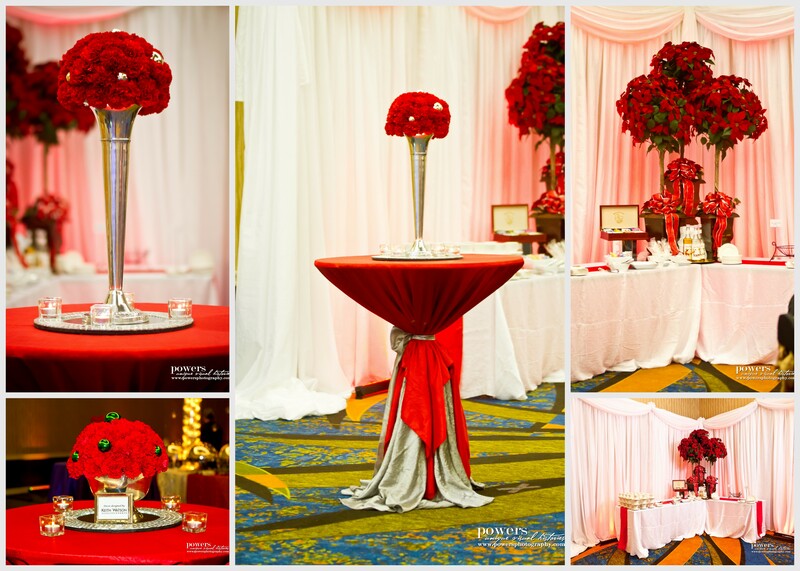 This entire structure was covered in red roses and lead the guests into the ballroom where the rest of the event was held. Paired with a red carpet, guests feel like they are getting the royal treatment. 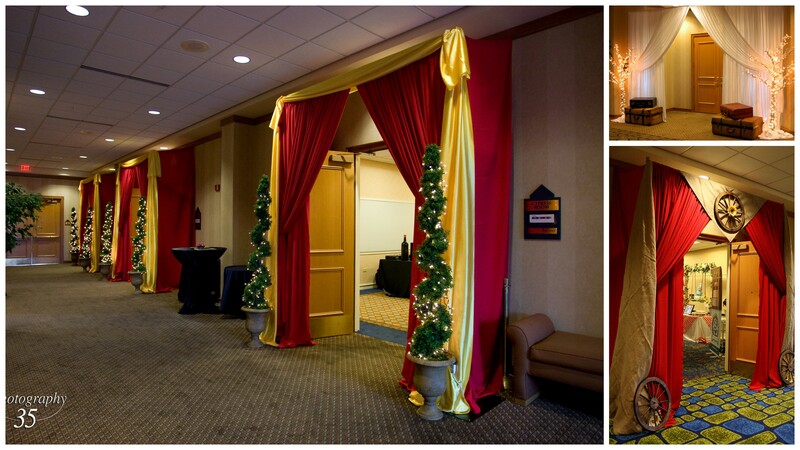 Another way to create impact is to drape the doors or entryway for your event with a bold print fabric. We love this simple black and white stripe, but a bright red or pink would also have a great effect. If you are having a themed event, dressing up your entrance is a great way to carry the feeling of the event from start to finish. For example, Keith Watson Events used blue and white draping along with fishermans netting, seashells, and starfish to bring the feel of the ocean to the entrance of this room. 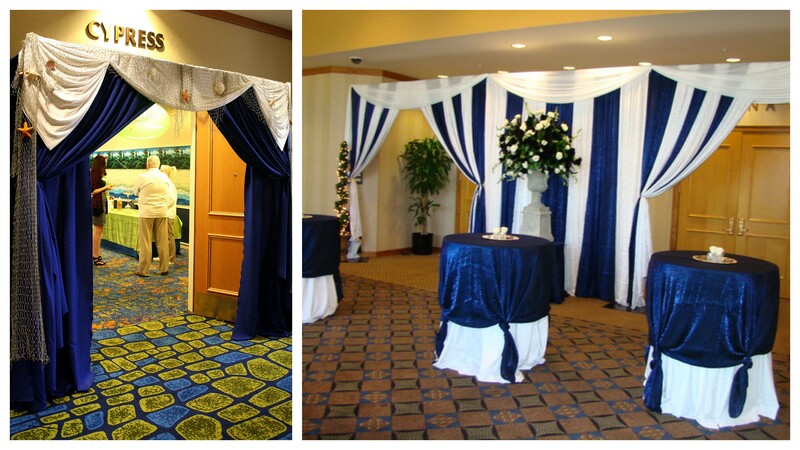 For a 75th anniversary dinner, we chose blue and white striped draping for the entrance. Coordinating the rest of the linens with the entryway gave a cohesive feel to the space. 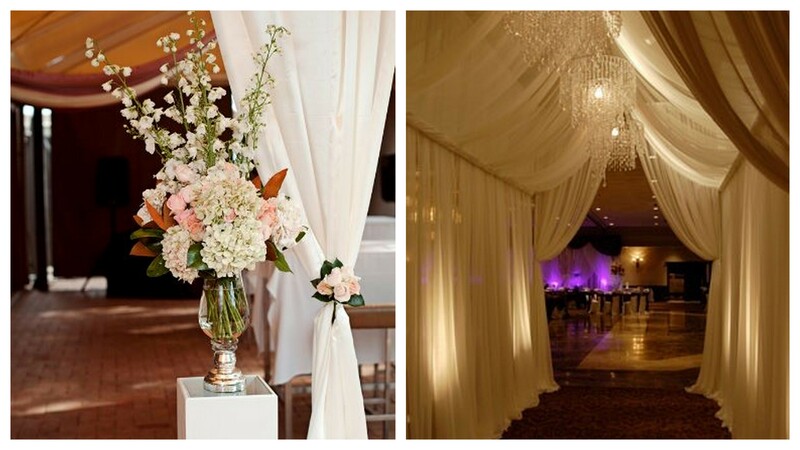 If you are wanting something with a more neutral pallet, white draping accented with flowers is always a great idea. We love this stunning flower arrangement paired with white draping at the entrance to this tent. The flower detail on the drape ties the two pieces together. Covering a boring hotel hallway with white fabric completely changes the feel your guests get when they arrive at your event. The crystal chandeliers add sparkle and glamor. These next designs are great for Bar or Bat Mitzvahs. 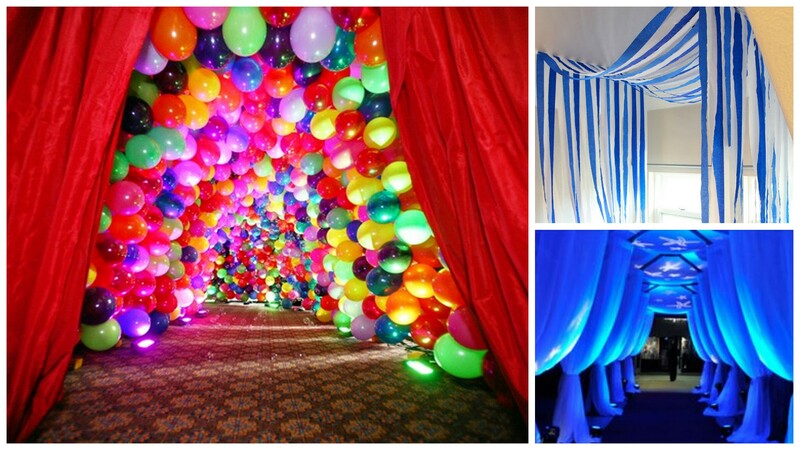 This balloon tunnel was created for a circus-themed Bar Mitzvah. The red drapes create drama and make you feel like you are walking into a big-top tent. For a nautical themed event, try hanging blue and white paper streamers just inside the door where guests walk in. If you are having a winter event, rows of white drapes accented with blue lighting make you feel cold just looking at them. The white snowflake light designs on the ceiling add a subtle winter detail. If there are multiple entryways for an event, dressing them all the same unifies the look of the event. For these entrances, Keith Watson Events decided that ceiling-high draping would make the entrance feel grand and have high visual impact. The topiaries to each side add interest and draw the eye up, accentuating the height of the drapes. Using props at the entrance is a great way to announce the theme for your party. For one of our events, we stacked vintage suitcases on each side of the entryway for a travel theme. If you are having a party with a more rustic style, consider using burlap at your entryway. For our event, we combined burlap, red draping, and wagon wheels to set the feeling for the room. 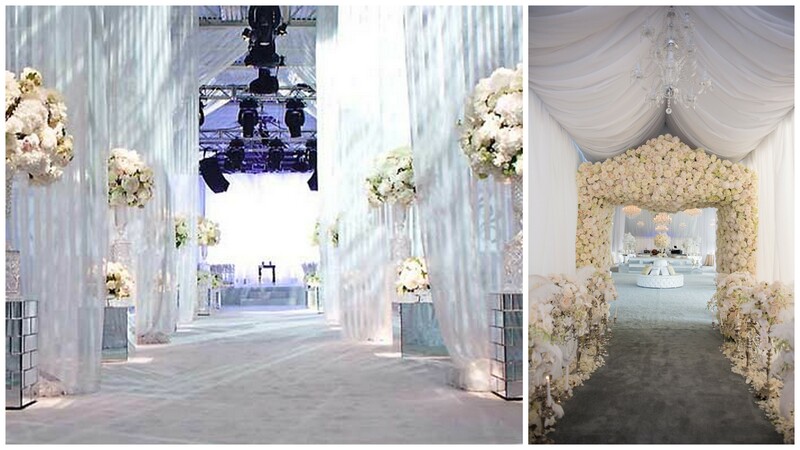 For an all white event, these two entrances are sure to please. Combining white roses and white draping creates an entryway that is far from boring. 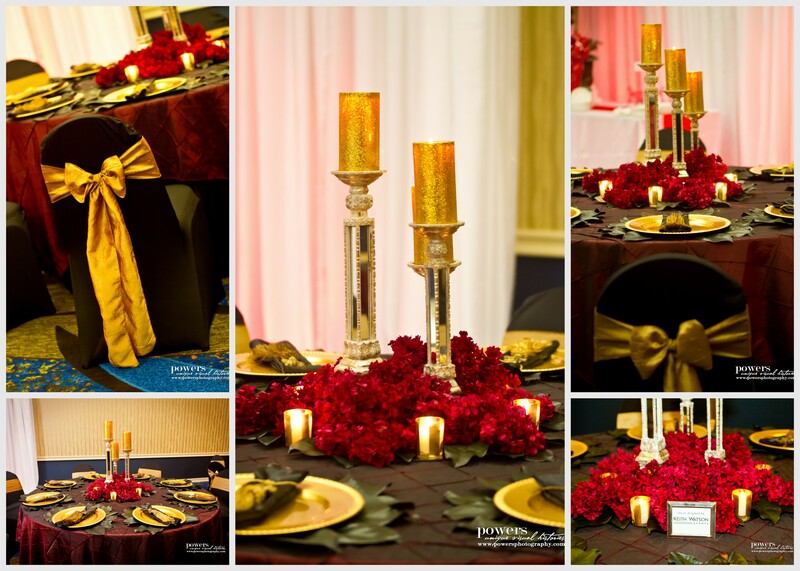 The candelabras lining the walls adds impact and glamor for the guests. Using white striped drapes and mirrored columns create a gorgeous modern entrance. The white flower arrangements in crystal vases soften the look. This entryway is clean and elegant but definitely high impact. What do you think of these designs? Do you know of other high-impact entryways? Every bride dreams of the day when she will walk down the aisle. But many are looking for something other than the traditional tulle and flowers. We have pulled together some of the most beautiful and uniquely decorated aisles to help inspire your walk on your big day! We love the drama that this swirl design adds to the aisle. This lovely pattern is created using rose petals, and can be done in either one solid color, or multicolored. 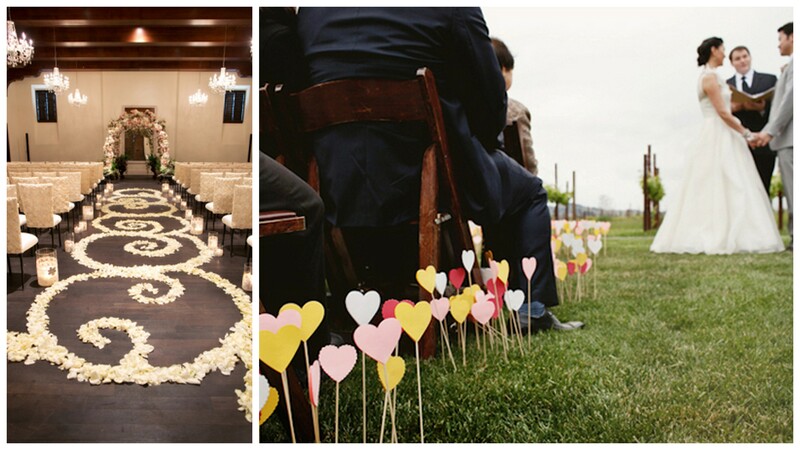 If you are looking for something a little more casual, these paper hearts lining the aisle add a unique charm. This aisle sets a fun and casual tone for the rest of the day. We love the touch of blue used in these aisles. These lovely bouquets of hydrangeas and roses hung from shepherds hooks and lined the aisle of our very own bride, Susan Browning Steiglitz, at her Santa Fe River Ranch wedding. The colors of these arrangements were stunning, and created an elegant feel to this outdoor wedding. Not every aisle runner has to be white. 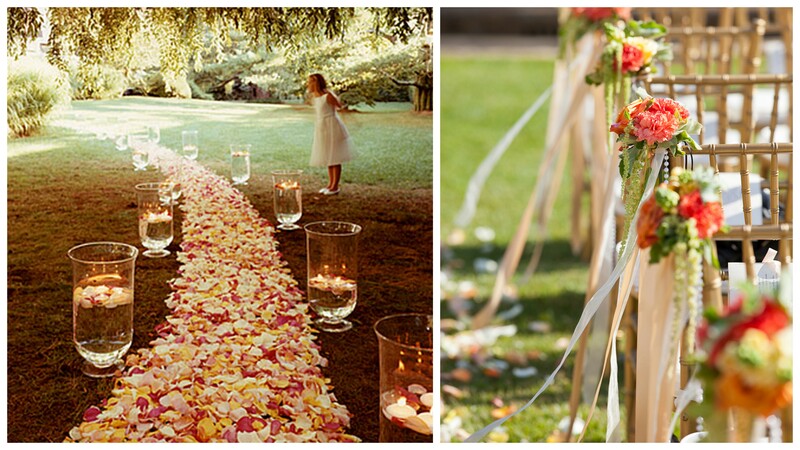 The soft white rose petals are the perfect finishing touch to this simple yet beautiful aisle. Colorful aisles are so much fun! The swirl patterns around the edge of the aisle and the bright orange runner look great against the clean white in the rest of the room. 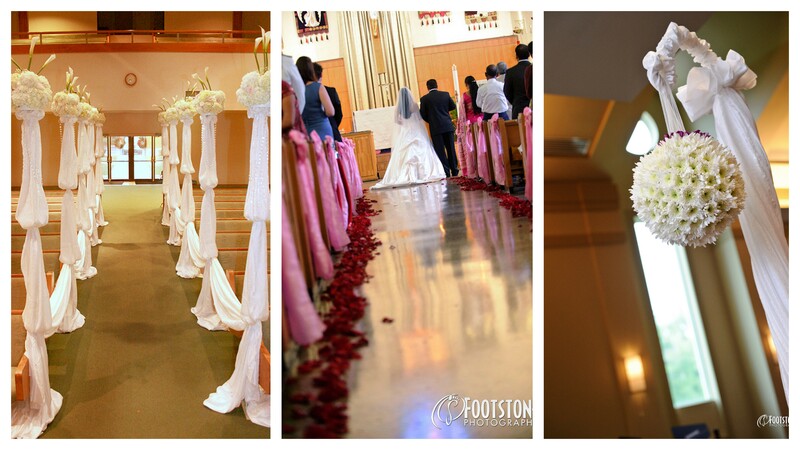 The pink columns with flower arrangements add detail to the design of the aisle and match the columns on the altar. If you are looking for a more non-traditional aisle concept, try this unique spiral arrangement for your chairs. This design allows all of your guests to get a great view of you as you make your way to your I-do’s. Accenting the entrance with bright floral arrangements and scattering rose petals along the edge adds just enough color while keeping the aisle clean and contemporary. If your ceremony will be held in a church, don’t worry, there are many ways to beautify your walk down the aisle too, as seen in these photos of past couple’s ceremonies. Consider white flower arrangements placed on tall pedestals lining the aisle. The crystals hanging from the flowers added sparkle to this aisle at Mt. Carmel Baptist Church. Another option is to add simple bows to the end of each pew at St. Augustine Catholic Church. The red petals and the pink ribbon created a beautiful romantic feel. If you are looking for something more causal, you can line your aisle with flower pomanders hanging from shepherds hooks. These can be done in many colors, accented with colored pearl heard pins. 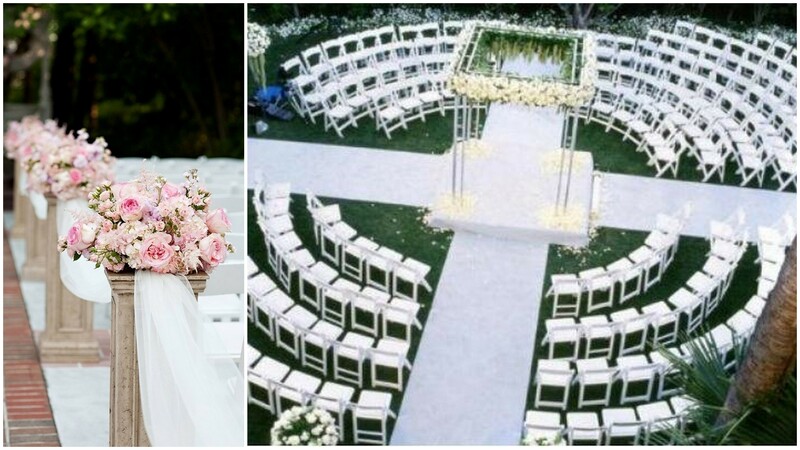 Arranging your ceremony chairs in a circle around your chuppah or altar allows a 360 degree view for you and your guests. This arrangement works great for large square or irregularly shaped areas, and creates a beautiful symmetry for the space. If you are looking for something elegant for your aisle, this arrangement of stone columns and soft pink flowers would look lovely. The sheer fabric draped between columns softens the stone and gives a lovely airy feel to the aisle. For a more rustic outdoor wedding, there are still plenty of unique ways to dress up your aisle. We love this burlap runner for an outdoor wedding. 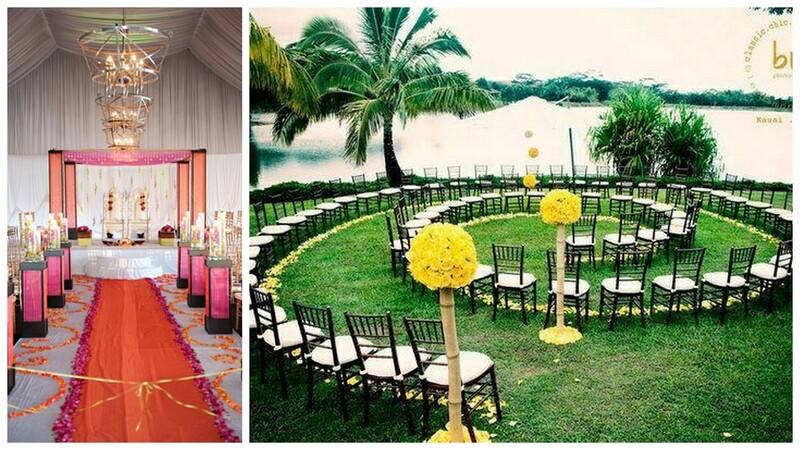 The small flower arrangements on the edges of the chairs lining the aisle visually softens the rough fabric. If you are having your ceremony under the open sky, consider a mirrored aisle. 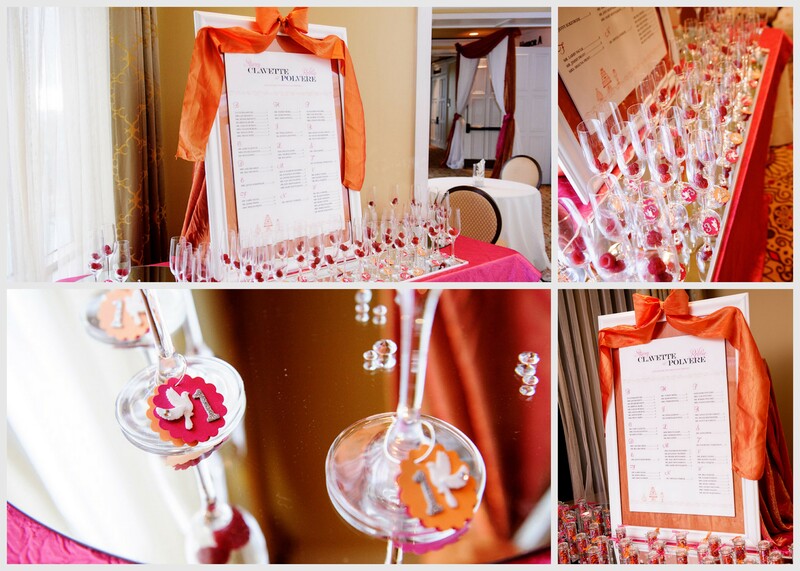 This design is created using individual plexi-glass mirrors and then lining the aisle with bright red ribbon or fabric. The reflection of the sky above looks amazing in photographs. Finally, these last two aisles will forever be classic and elegant. This first aisle is covered completely with multi colored rose petals. Accented by floating candles and rose petals in large hurricane vases, this aisle winds its way to the ceremony, allowing the bride and her father to share a sweet and intimate walk together. The long flowing ribbons on this next aisle create a romantic feel as they flutter in the breeze. The small arrangements on the corner of the chairs add a bit of simple elegance to this lovely aisle. What do you think about these unique designs? Do you plan on having a non-traditional aisle on your big day? A Great Gatsby or Roaring 20’s themed party is full of glamor and sparkle! Following the recent release of the movie “The Great Gatsby”, 1920’s themed parties have become a hot trend in events. Creating a party that takes your guests back to the Prohibition Era is easy. 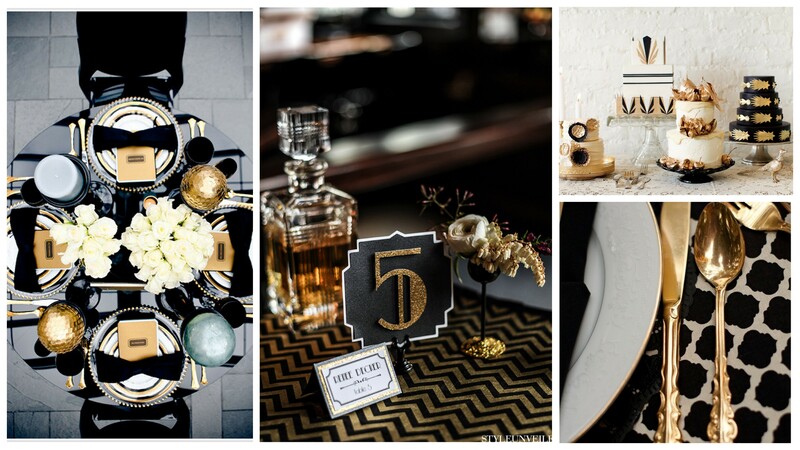 Start with a classic pallet of black and gold and embellish with touches of crystal. For your tablescape, use simple patterned linens as a base and accent with gold rimmed charger plates or goldware for a more opulent feel. For the table numbers, opt for an art deco style cutout with a clean font for the numbers. Continue your art-deco feel with your food. Choose a clean geometric pattern for cakes or serve hors d’oeuvres on gold dishes. We love these 20’s themed details that add that something special to the party. 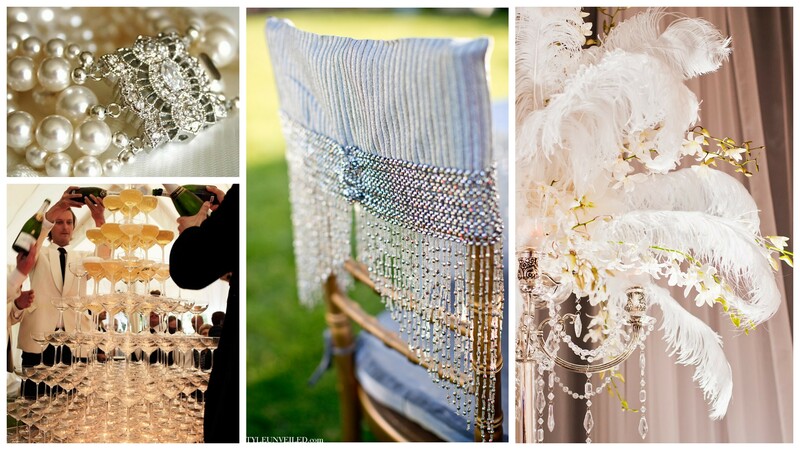 Instead of traditional chair sashes, consider a chair cover with beaded fringe, reminiscent of flirty flapper dresses. Pearl accents on napkin rings and in the floral design add a soft feel to the room. For a more grand centerpiece, this feathered arrangement with orchids and crystals becomes a focal point in the room. We can’t forget the champagne! A champagne tower is a wonderful design element and is always a great hit with guests. For a fun way to get your guests in the spirit, provide the male guests with fedoras and the female guests with long strands of pearls when they arrive. Continue the 20’s feel with a costumed live band to keep guests on the dance floor long into the night. What do you think about throwing a Gatsby themed party? Are there any other ways to create a 1920’s feel? 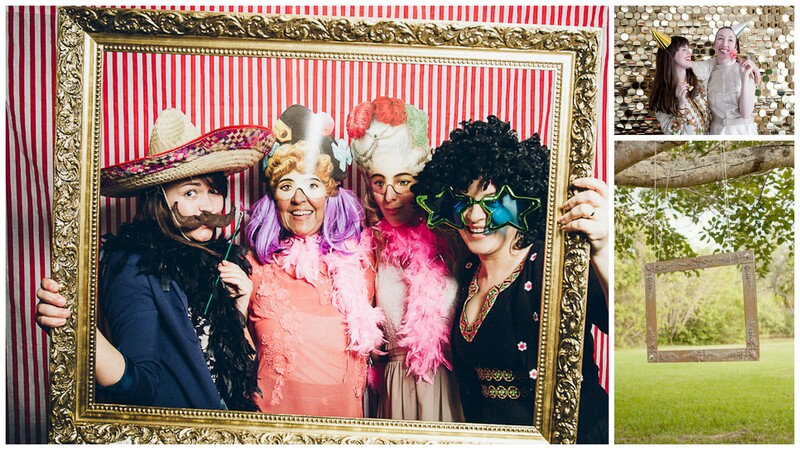 Are you planning on using a photo booth at your wedding? 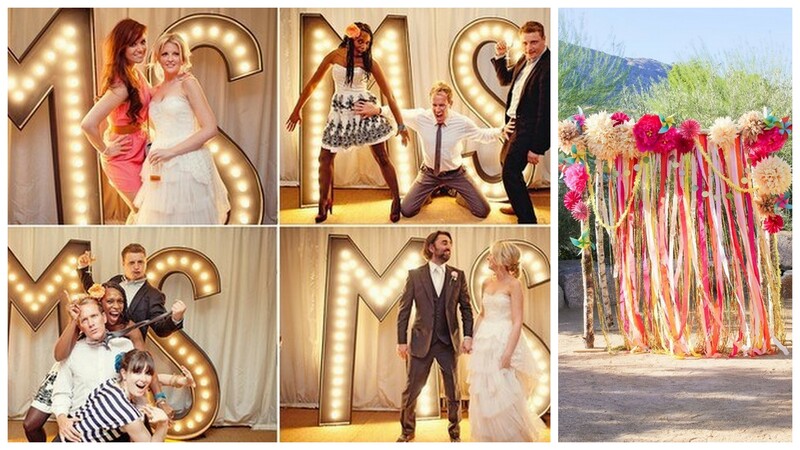 There are so many creative ways to incorporate your wedding theme into your guests’ pictures. We have pulled together some of our favorite wedding photo backdrops for you to look at. 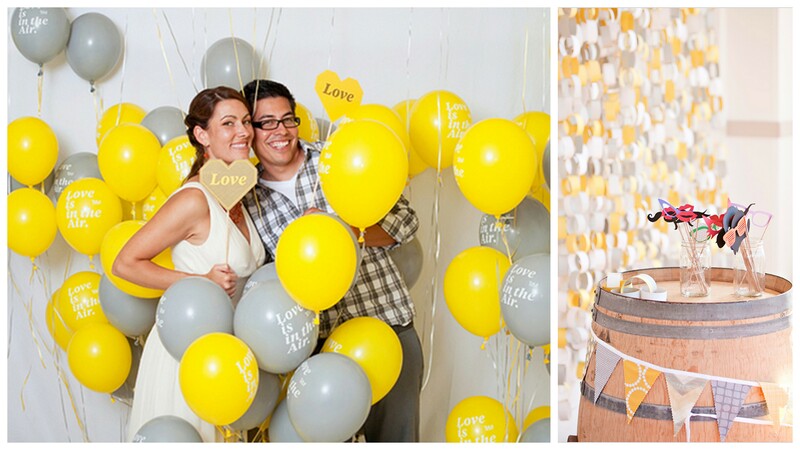 Balloons are a super fun and easy way to incorporate your wedding colors into the photos. If you want to customize them a little more, you can order balloons with your wedding date or other sweet sayings printed on them. Paper chain walls are another inexpensive option for your photo booth. You and your bridesmaids can spend an evening putting them together during a movie marathon. 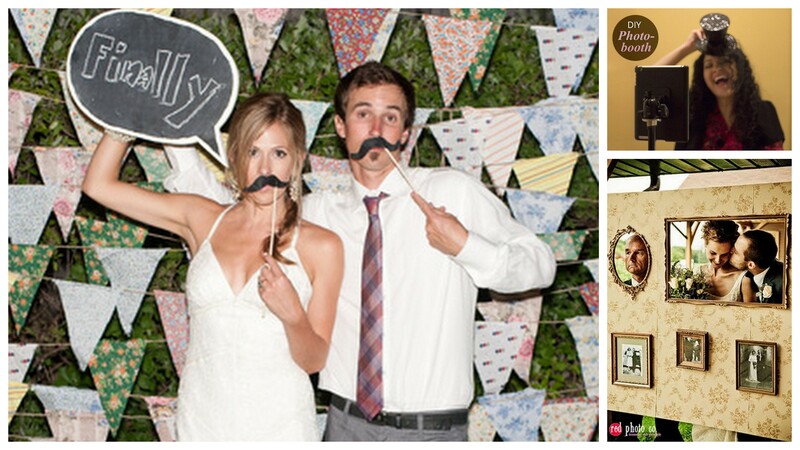 Add props like mustaches, kissing lips, and glasses and you have a cute photo opportunity for guests. You can also hang a panel of damask or other printed fabric and provide your guests with an ornate or brightly colored frame so they can take individual or group pictures in a fun, unique way. If you are having an outdoor wedding, hanging a rustic frame from a tree branch and allowing the surrounding scenery to be the background makes a lovely photo. These light up initials are so unique! 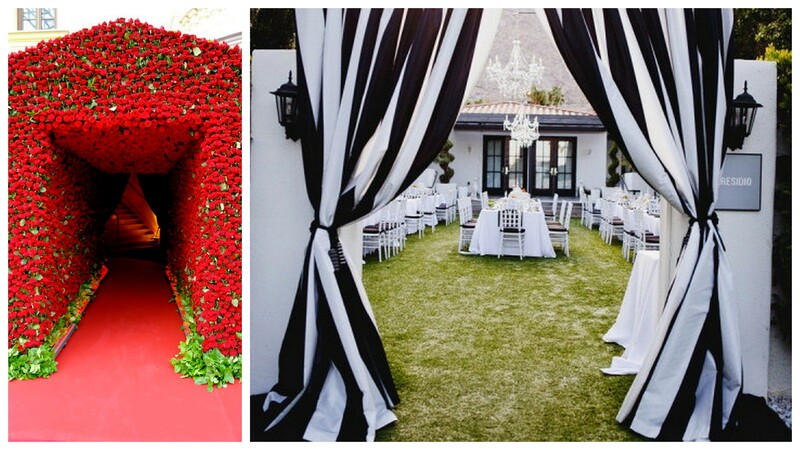 We love this idea for a Hollywood or modern themed wedding. Another fun idea incorporates colorful streamers and paper flowers as a backdrop which creates a beautiful picture, especially for an outdoor wedding. The best thing about this particular backdrop is that it is really easy to customize the streamers to fit your colors. Great props can make the difference for a photo booth. Chalk board speech bubbles allow your guests to send you a personalized message, making the pictures double as your guest book! Photo frame walls are also another popular idea. Gluing framed pictures of your and your groom’s family onto a foam core wall and adding empty frames for guests to put themselves in creates an adorable look. If you would like to create one of these booths, but don’t want to hire a photographer to man it, there are now apps for the iPad that allow guests to take the photos themselves. All you need is the app and an iPad tripod which can be found online. What fun! Are you planning on having a unique photo booth at your wedding? Have you seen other unique photo booth ideas? Here at Keith Watson Events, more and more brides are requesting that the grand exit at their wedding be a sparkler send off with all of their guests. We love the amazing photos that come from it and embrace the unique idea, but here are a few tips on how to make this wedding trend go off without a hitch! It is important for guests to know what time they should begin gathering for the sparkler send off and where. The DJ or emcee can definitely help by making an announcement when the time comes, but it’s a great idea to have a few signs displayed around the reception area so guests are made aware of the time this is occurring and to get them excited for it! Packaging the sparklers in a personalized presentation is an easy way to store and display them for guests. Fill a galvanized tub or a wooden crate with these sparkler sets and have them set out in the area the sparkler send off will take place. It is a much more organized and hassle-free way to make sure every guest has a sparkler rather than just passing them out. Another VERY important thing to remember if you are interested in having a sparkler send off is the size of the sparkler. Some brides make the mistake of purchasing sparklers that are too short in length. You want the sparkler to be as long as possible. The shorter the sparkler, the less time all of your guests have to get all of them lit at the same time. This means the bride and groom have a shorter window to make their grand exit as well as a smaller amount of time to capture that amazing photo of the send off. This process is very choreographed, so it also helps if you have several people in charge of directing all of your guests to begin lighting their sparklers. We recommend having multiple lighters stationed in different areas throughout the area where your guests are gathered. We also find that sparklers light better off of each other, so once one is lit, begin having guests light their sparklers off of the flames of already lit ones. Brides – don’t forget to stop and kiss the groom for an amazing photo and memory! How cute are these couples? And what an incredible photo with the sparklers lighting the bride and groom! Would you be interested in a sparkler send off at your wedding? It’s that time of the year again! Children are back in school, and why not dress up your home with a little “back to school” decor to get the kids excited for this time of the year. 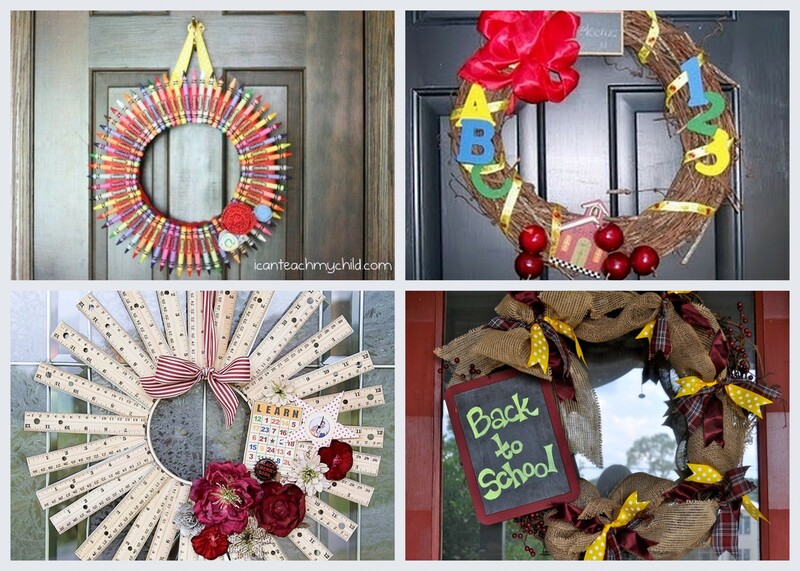 Wreaths are a great way to not only share your love for back to school with your family but also with your neighbors. Show them you creative side by displaying one of these adorable wreaths on your front door. Incorporating all different kinds of school supplies such as crayons, rulers, chalk boards, apples, etc. is an easy yet unique way to create “back to school” decor. 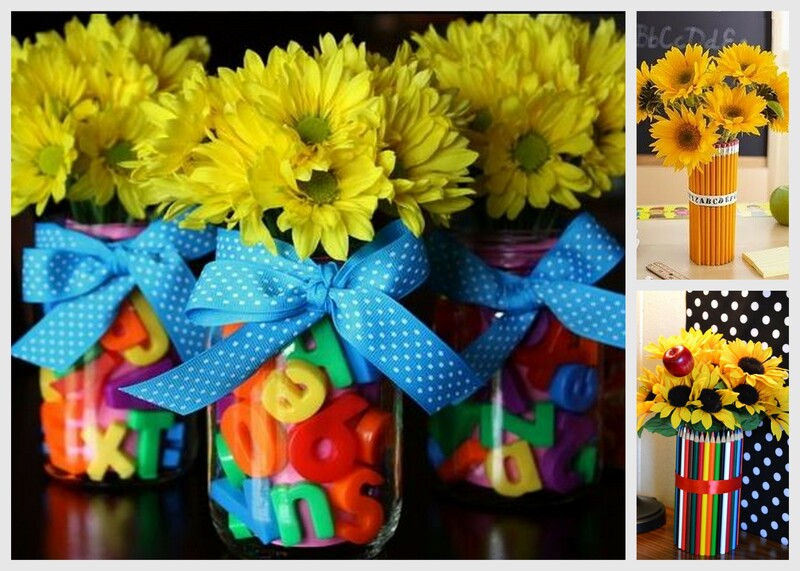 Here are some cute ideas for “back to school” themed centerpieces at your home or even a unique idea to give to your children’s teachers! Again, using all sorts of school supplies in these centerpieces is a cost effective way to keep your tablescape bright and colorful and get kids in the school spirit! 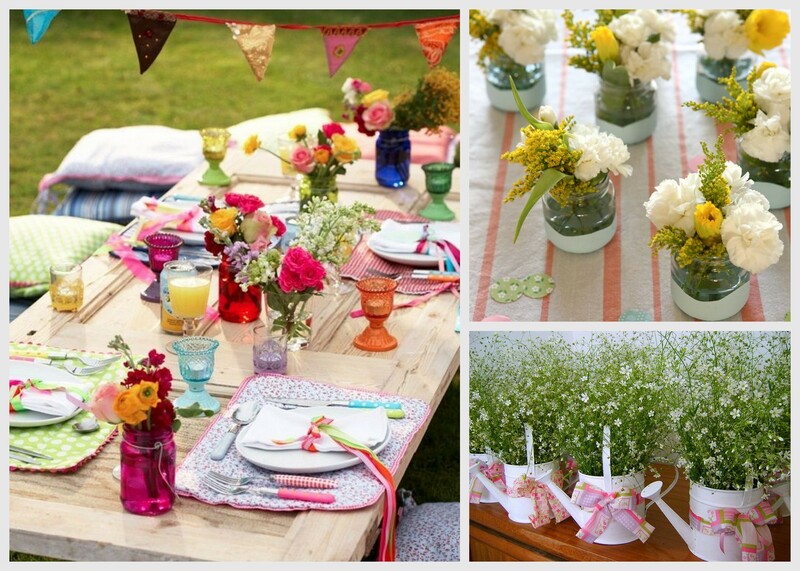 Adding fresh flowers such as daises, sunflowers, or carnations is another great idea to add pops of color to a table! 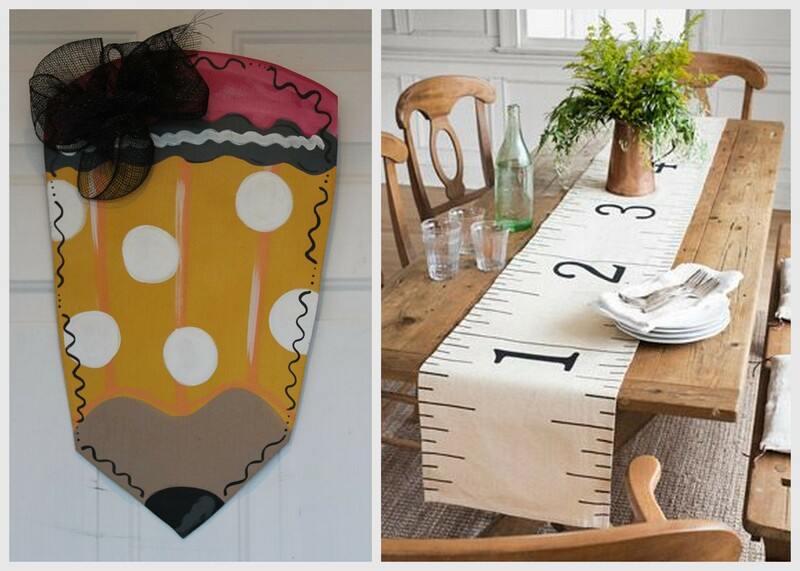 Check out this awesome ruler table runner and pencil wall decor. These are easy DIY projects and would be great decor pieces that could easily be used every year when back to school rolls around to get kids excited! What do you think of these “back to school” decor ideas? What are some ways you get your children excited about the new school year? With all the recent talk about the royal baby, we decided to give our readers some tips on how to throw a beautiful and fun baby shower! Not everyone is looking to break the bank when throwing a shower. 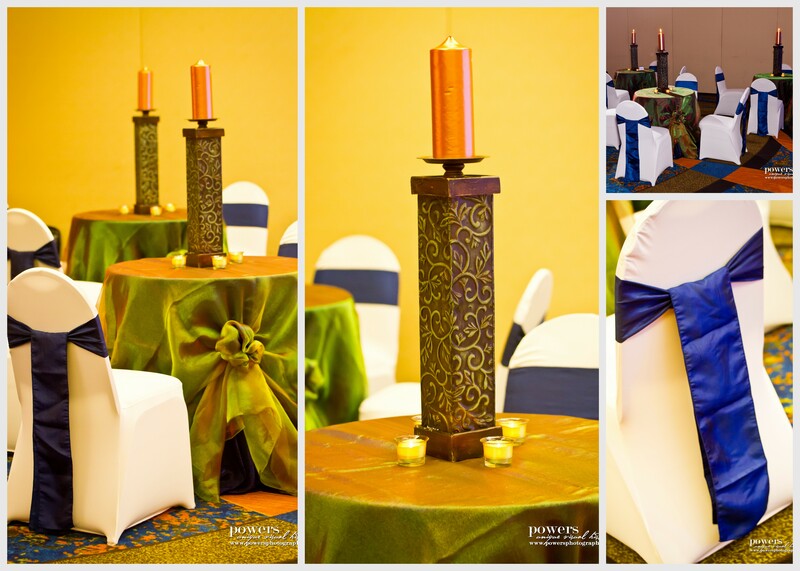 That is why we geared more toward simple, yet elegant decor that almost anyone can replicate for an event. 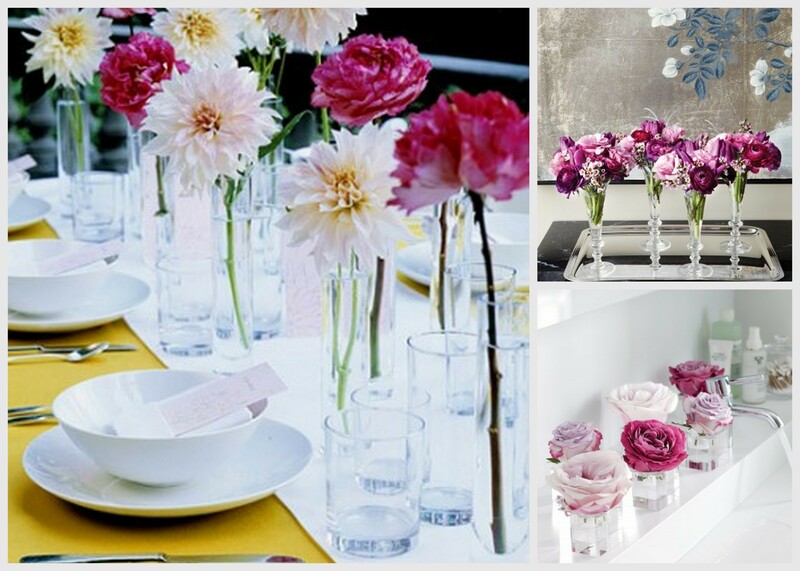 Centerpieces will definitely add to the ambiance at a shower, and floral is an easy way to add a pop of color. An elaborate arrangement is not needed, but a more simple, smaller arrangement will give your table a focal point and enhance guests’ experience. Using mason jars or small glass bottles is definitely a cost effective and adorable idea to have a simple centerpiece arrangement on the tables at a shower. Wild flowers are currently trending for centerpiece designs at weddings, and this look can easily be used at a shower as well. 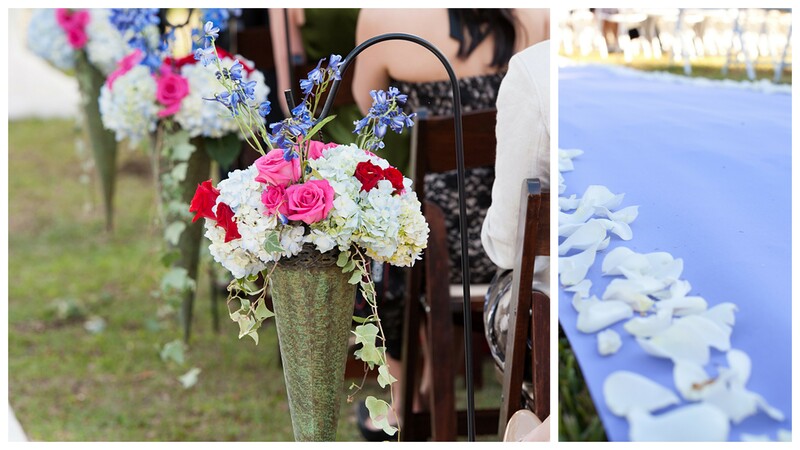 We also love the fun idea of using baby’s breath at a baby shower! Fill a tin watering can or a galvanized bucket with baby’s breath and place on tables, and you have a perfect centerpiece for a small, outdoor gathering at a shower! For an even more cost efficient arrangement for tables, we like the idea of using a single flower placed in a tall, slender vase to create height on a table, or a single rose bud in a votive candle holder for a lower arrangement. How adorable are the champagne flutes filled with flowers as well!? 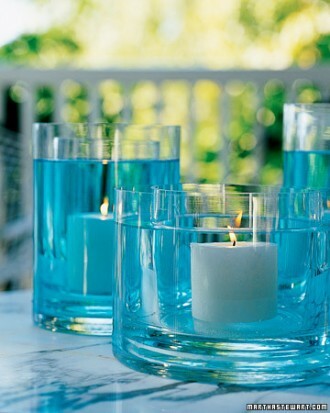 Filling a cylinder vase with water dyed blue or pink to symbolize a boy or a girl topped with a floating candle is another creative way to save money by eliminating floral but still adding color to a tablescape. 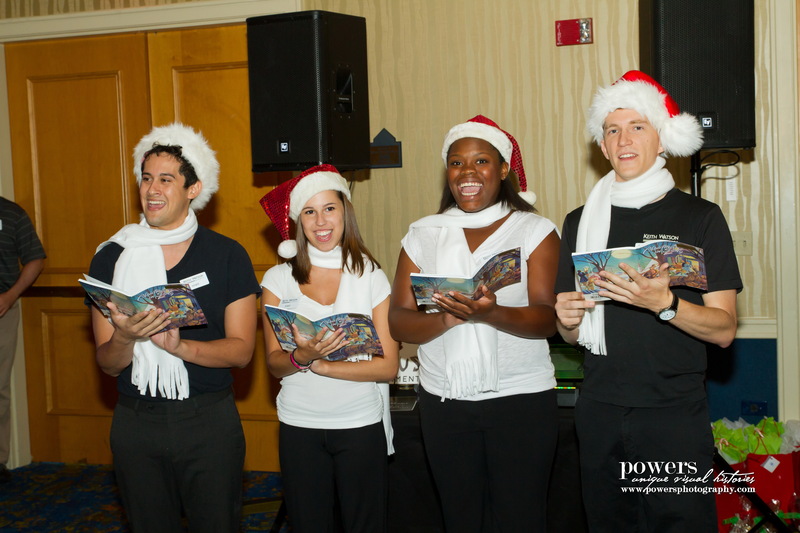 Getting guests involved at an event is a great way to increase enjoyment at a party. Fun games are easy to create for a baby shower. “Take a Guess” game is a unique place card displayed at each table setting for guests to partake in as they sit down to enjoy food. A “Blindfolded Diaper Change” game is a great way to get guests on their feet and enjoy what this whole event is centered around – BABIES! 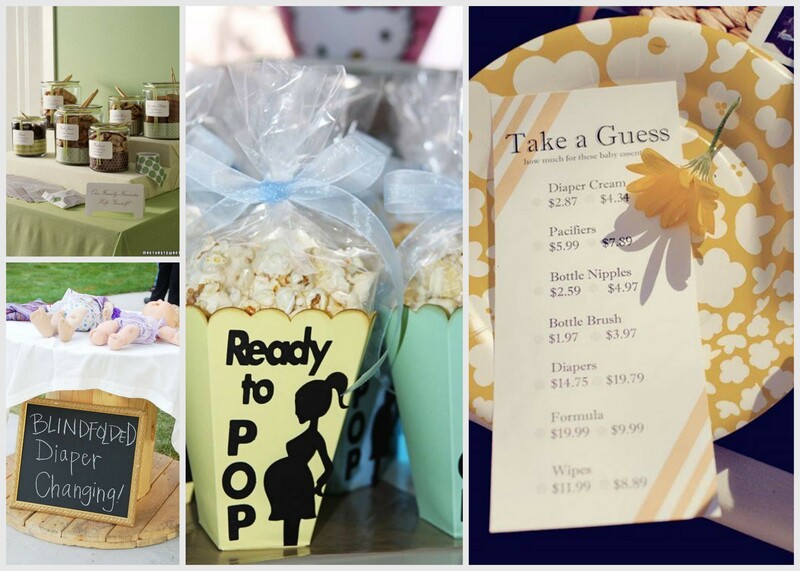 Creating unique baby themed favors is a great way to show appreciation for your guests’ attendance at the shower. Why not add a fun tag line to the favor boxes like the one shown below on the popcorn box, or a milk and cookies bar! What are some other cute/unique ideas for decor, favors, games, etc. you’ve seen at baby showers? Keith Watson Events was all over the map this summer, traveling to different tropical settings throughout Florida for a number of our brides’ destination weddings. We were so excited to be a part of the beautiful wedding of Stacey & Robbie Polvere at The Sandpearl Resort in Clearwater, Florida. This breathtaking oceanside resort was a perfect venue for this June wedding. Stacey & Robbie were such a wonderful couple to work with. Take a look at some pictures on their big photo day shoot by Footstone Photography! 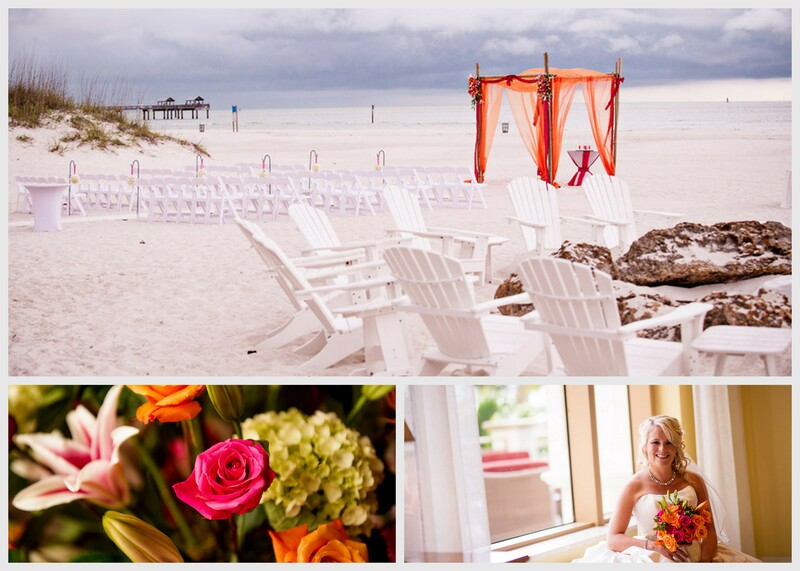 The ceremony location was absolutely stunning on the resort’s beachfront property. We lined the aisle with floral balls on shepherds hooks, and we also created a bamboo arbor draped in sheer fabrics in their wedding colors with two floral buttons that accented the top. Take a look at the beautiful bride – she was beaming the whole day! After the ceremony, guests proceeded inside where cocktail hour began. Stacey & Robbie’s seating chart, set up where cocktail hour was held, was so cute and unique that we just had to share it! Below are pictures of the display Keith Watson Events & Footstone Photography helped design. Guests found their names on the seating chart displayed in a large picture frame and matched the table number listed to the designated champagne flute charm number. Guests were then able to take a flute with their assigned table number charm to their table and enjoy the champagne as dinner was being served. 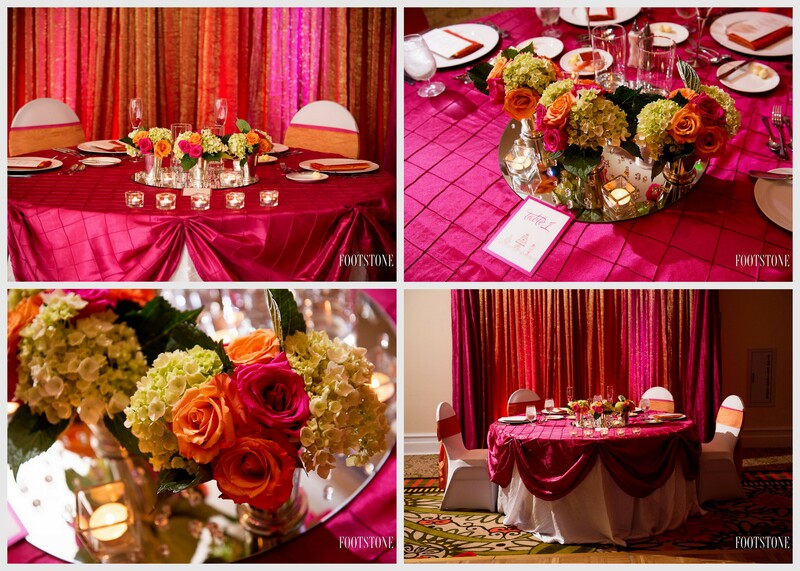 Orange and fuchsia continued in the decor at the reception. Stacey & Robbie wanted a very romantic feel for the decor with vintage centerpieces, as well as incorporating tropical floral design to complement their beach wedding. Take a look! During the reception, we designed a head table for Stacey, Robbie and their son & daughter which displayed a complementing vintage floral arrangement in mint julep cups lining the front of the table. 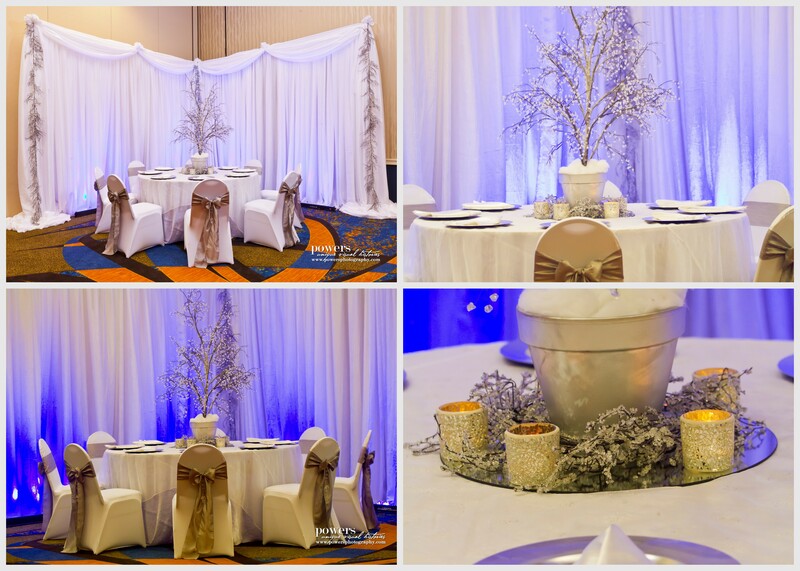 We also added a pipe and drape vignette backdrop with uplighting in their wedding colors which helped to make them the focal point of the room. The champagne flute/guest seating chart table was later transformed into the wedding favor table. Check out the couple’s wedding favors for guests. 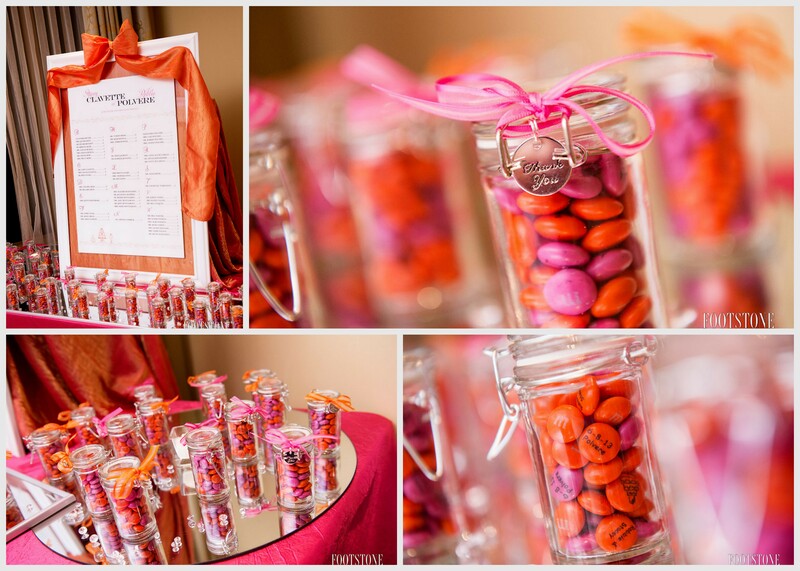 Personalized M&M’s in their wedding colors! How cute?! 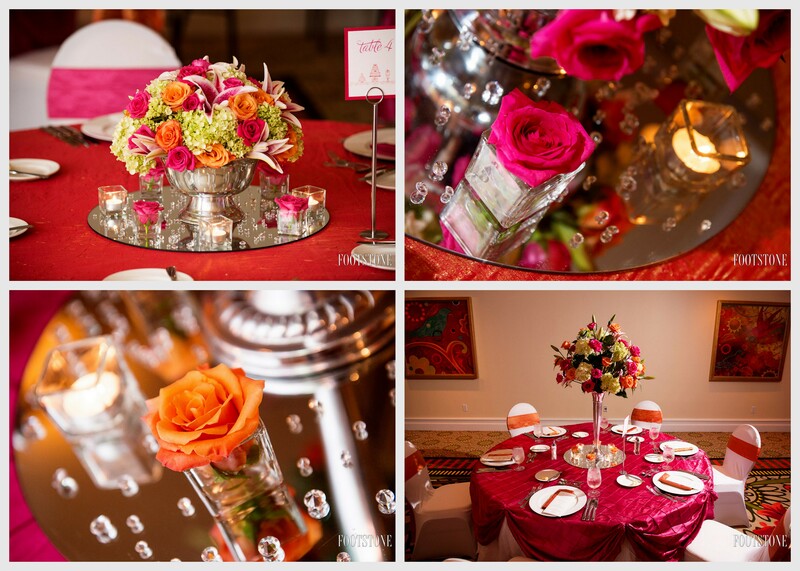 Not only did we love designing the decor and floral for this couple, but we also had so much fun at the wedding! Keith Watson Events wishes Stacey & Robbie Polvere a long and happy life together! 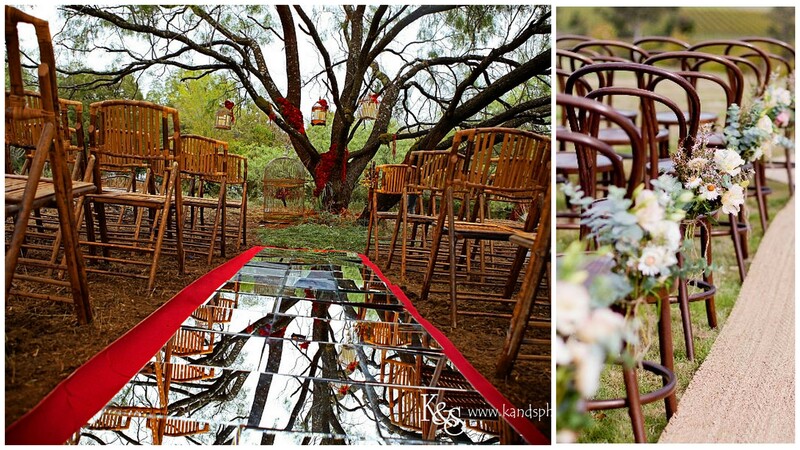 Tell us what you think of this wedding decor? Keith Watson Events was very excited to have the opportunity to showcase some upcoming holiday trends at The Hilton’s, “Christmas in July” event in Gainesville, Florida! Take a look at some of the Christmas displays we were able to present, complete with our Keith Watson Carolers! A big thanks to Powers Photography for these amazing images! We are so thrilled to already have clients booking their holiday parties with us and can’t wait to open the Keith Watson Christmas Shop in the Tioga Town Center very soon. We just returned from a fun week at market, where we made so many fabulous Christmas purchases for the shop, so be on the lookout for more pictures of the new Christmas decor available for purchase soon! Does this make anyone else SO excited for Christmas? !